Quite a long time since I reviewed a French wine, in fact I have been asked if I drink french wines! the answer is of course I do.Often when shopping for wine I simply find that a lot of the wines with really good deals on them are not the french ones. I drink wines that appeal to me, that I feel will go well with the food I am eating and the mood I am in. This particular wine is what I would consider a serious wine, not one for drinking in the garden. I do not think I would drink it at lunchtime either, to me this is a wine that needs a robust meal with it. Do not get me wrong this is a beautiful full wine, masses of fruity flavour and a hint of spice coming through and it is a heavy wine, the flavours linger in your mouth even after you have drank it. I consider this Cotes du Rhone froooom the South of France it to be a classy wine that asks for respect, goes beautifully with a Beef Wellington or a Venison dish, I also found it likes to breath, I gave it an hour and it had become gently soft on the palate. 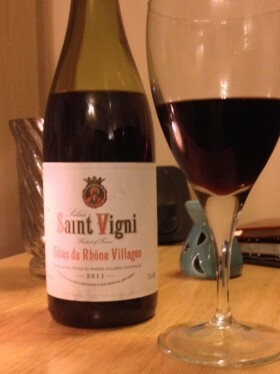 I bought this Saint Vigni Cote du Rhone from Waitrose at a very nice price of £6.99 which was a saving of £2 per bottle.